Below are photos and descriptions of landmarks from a walking tour of the Palisades District in Washington DC. The tour starts from the Palisades Recreation Center, 5138 Sherier Place NW, Washington DC, GPS = 38.92525,-77.10339. The walk is about 5.75 miles and takes about 2 hours. The surface is a mix of sidewalks and dirt paths. There are many elevation changes throughout, but with the exception of one shortcut, much of it is graded, making for easier walking. A Google map of the route is located online here, and a link to a pdf version you can download and print out to take with you during the tour is at the bottom of the page. For convenience, the maps include locations of several restaurants in the area, but their inclusion is not intended as a commercial endorsement. 1. Old wagon road, Dana Place NW. Conduit Road, later renamed MacArthur Boulevard, opened in 1863 after the Washington Aqueduct was built. The “Dana Place Road” soon followed. One block of this old wagon road still remains between Eskridge Terrace and Garfield Street. 2. Conduit Road Schoolhouse, 4954 MacArthur Blvd. The Conduit Road Schoolhouse is a one-story one-room clapboard building with a brick foundation built in 1874 to replace one built 10 years earlier which had burned down. It was designed by a District of Columbia government architect and reflects bare mid-Victorian style typical of government schoolhouses in the late 1800’s. The school closed in 1928, and served as a branch of the public library. In 1965, it was saved for use as the Children’s Museum. 3. Glen Hurst, 4933 MacArthur Blvd NW, is a Queen Anne style house built in 1892 for the John C. Hurst family. Around 1890, a subdivision venture called “Palisades of the Potomac” was planned around V, W, Ashby, 48th and 49th Streets as an expensive suburb with homes of the type then being built on the Hudson above New York. The president of the venture was Washington Post founder Stilson Hutchins. Hutchins founded the newspaper in 1877, and sold it in 1889, just prior to the real estate venture. Jacob Clark and John C. Hurst, both from Canada, were the vice president and real estate broker, respectively. Richard Ough was the architect. The venture collapsed in the late 1890s due to a downturn in the real estate market. Hutchins seems to have emerged relatively unscathed — by 1911 he still was worth at least $3 million (somewhere around $1.4 billion in today’s terms), because his wife unsuccessfully sought to have him declared insane in order to get control of it. 4. Washington Psychoanalytic Institute, 4925 MacArthur Blvd NW. This house, designed by Richard Ough, is one of the first five houses built for the Palisades of the Potomac development. The homes all featured a fieldstone wall along the sidewalks. 5. Ough House, 4898 MacArthur Blvd NW. Richard Ough, the architect for the Palisades of the Potomac venture, built this Free Classic Queen Anne home in 1891 and lived here until 1894. 6. MacArthur Theater, 4859 MacArthur Boulevard NW. Now a CVS Pharmacy, this building was once MacArthur Theater, opened in 1946, and featured the world premiere of “Star Trek: The Motion Picture” in 1979. 8. The Clark House, at 4759 Reservoir Road NW, is a red sandstone castellated Gothic Revival built in 1893. Jacob Clark was a partner with Hutchinson and Hurst in the 1890s “Palisades on the Potomac” development. The Clarks lived in this house until 1923, when it became the Florence Crittenton Home for Unwed Mothers of Washington DC. It became the Lab School in 1976. Canal Road Tunnel. Just south of the railway trestle is a pedestrian tunnel that crosses under Canal Road NW to the C&O Canal towpath and Capital Crescent Trail. The tunnel is located just east of the south exit from Foundry Branch Valley Park. 13. Capital Crescent Trail. The trail runs on the abandoned right-of-way of the Georgetown Branch rail line of the B&O Railroad. The rail line was partially built in 1892 and completed in 1910. Trains stopped running on the line in 1985. The photo is of the bridge over the C&O Canal and Arizona Ave NW. 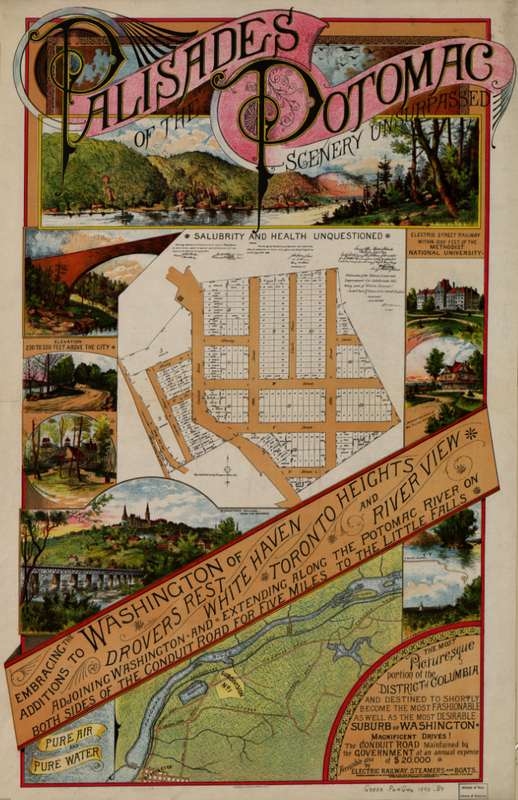 The “Palisades on the Potomac” poster is from the Library of Congress, American Memory. Photos of the Washington Psychoanalytic Institute and the Ough House are from The Palisades of Washington, Part 3, by Alice Fales Stewart. The photo of the old wagon road is from Google street view. All other photos are by the author. Notes on the locations are from Wikipedia and other sources as noted. The single most comprehensive narrative about the Palisades and the “Palisade on the Potomac” venture is the 2005 National Register of Historic Places application for Glen Hurst, available here in pdf format. This entry was posted in Hiking, History, Photography and tagged architecture, C&O Canal, Capital Crescent Trail, history, outdoors, Palisades, Washington DC. Bookmark the permalink. Enjoyed the tour, thank you. Thanks! I was surprised to find so many interesting sights along with a pleasant walk. As I was putting together this month’s ACC newsletter, this caught my attention. I grew up not far from Palisades, in Foxhall Village. Thanks for the tour — I didn’t know much about the area! Thanks! While researching this tour I discovered that development of the Foxhall area began in the 1880s and it was originally named Harlem, after Haarlem in the Netherland. Most of the community’s landmarks date from the 1920s. There’s more here.